There are cell phones that are nearly as functional as pocket PCs. There are phones that are small enough to be put into the lighter pocket of your jeans. And there are also handsets that are not so functional and not so minute, but that can still surprise people by their design. Haier Pen Phone P5 is just one of them. This device looks like anything but a mobile phone. What is it? A laser toy-pointer? A trinket? A digital dictating machine? In fact, all in one. And besides, it is also a phone. Indeed, the P5 form factor is one of the most unusual today. Although the too narrow body causes the phone to be as long as 135 mm, and that is not a device to wear in your jeans pocket. Haier developers realised that and fitted the handset with a removable clip that allows to fix the phone to, say, a breast pocket of your shirt. But the clip doesn't seem to be safe enough (it is made of rather thin plastic), and we would recommend to wear the handset in the pocket and to quell your desire to make others see it. We feared that the digit keys wouldn't be big enough (they seemed so small in pictures), but luckily, the slantwise keys proved to be very handy and pleasant. Now let's examine the technical aspects of P5. 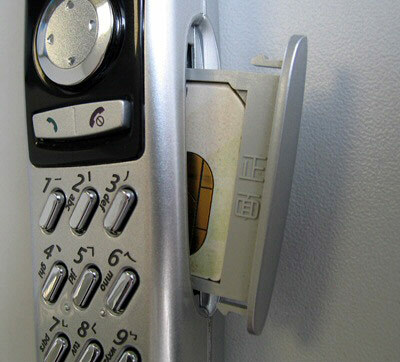 To install a SIM card you have to take a sliding block out of the right-hand side. It hardly needs to be said that the card is placed vertically, considering the body form. What we really have to mention is that it is easy to confuse the block's sides and if you try to put it in upside down your mistake can bring a sad end to the fragile plastic. The battery is placed under a cover fixed so safely we never managed to open the battery compartment. Obviously, one has to use some special tools for it, but that is the business of the service centre. In respect of the run-down time, the battery lasted three days and a half in a moderate mode (15-20 minutes of talking per day, a moderate use of functions. A very active use (dictating machine, games, laser pointer) runs down the phone by the end of the second day. To finish the introduction of Haier P5, we will add that the socket for the charger plug or the headset is on the left-hand side. The upper end houses an aperture for a neck-cord (to wear the device around your neck or wrist), and the lower one contains a tiny laser-pointer window. The latter function can be both useful (for meetings or presentations) and entertaining (draws others' attention to the phone owner). The phone switches on by pressing the cancel button. Cancel and call buttons are one of the most functional in this model. It was caused by the phone's small body size: while conventionally-shaped models had enough room for a pair of additional buttons, P5 developers had to charge the call and cancel buttons with confirm and reject functions, respectively. It takes so little time to get used to it that you can't but press the green button for confirmation when handling other phones. A few words about the backlight. It is bright blue and, in our opinion, this colour fits best the silvery body (although, the body can also be red and blue). The display light fades slowly, in the finest tradition of Siemens, but the keypad backlight keeps on and goes out only when the display light fades away. As was expected before testing, the words are written vertically in the display because of its format, and you have to hold the handset sideways when operating the menu or the phone book. Although, there are also exceptions: thus, playing Tetris requires a vertical position of the phone. The developers have come up with two variants of standby-mode display. The first one contains the operator's name and the profile activated at the moment. Below, there is a small line with the date (month/day), the day of week and the current time. All this is written vertically. But once you press the down button of the joystick (see further), the display switches to the other mode. It shows big horizontal symbols of the current time (minutes below hours), three-point battery level, and five-point connection quality. The menu can be explored with the help of the round navigation key that is situated right under the display. The Up arrow invokes a so-called fast-access menu containing 10 most frequently used functions. Unfortunately, this list is programmed by the manufacturer and you can't personalise it. Although it includes really popular functions, such as voice records, alarm, calendar, messages, laser pointer activation, and keypad lock. The latter deserves a more detailed description. Unfortunately, there is no quick and simple locking here as in Nokia or Siemens handsets. Manually, it can be done in three stages: press the navigation key, scroll the fast-access menu to "Locking" (which is only in the middle) and select the option. This procedure takes a lot ot ime and effort, so if you fear that accidental touches may occur, you'd be better off with the automatic locking activated. This function is placed in Phone Settings. You can unlock the phone by pressing Up and holding down key 5. To get into the phone book press Left — I mean left for vertical position. Although you'll still have to turn the handset sideways as the entries are written vertically. The phone book is well organised, and you can find a name by pressing its first letter. The book only shows entry names, but once you linger on an entry a window will appear containing more details: name, phone, cell number. One of the drawbacks is that you can only write names in capital letters (at least we didn't manage to find the shift function). However, P5 reads correctly the entries in mixed letters made in another phone and saved to the SIM card. And finally, we'd like to note that the handset has its own memory and can store up to 300 entries — not a bad result for a kiddy like this. You can get into the main menu by pressing Right. 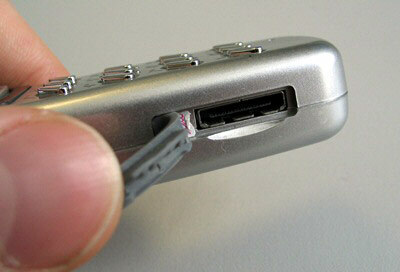 It contains nine items each of which can be fast-accessed by pressing a corresponding digit key. The first submenu is the phone book. Besides the things we have said above, we can add that user-group settings can be personalised. There are five groups there, and you can apply a logo and a ringtone to each of them. Besides, P5 enables to use voice dialling: there are 10 voice cells, and you can voice-dial a number by holding down the Left key in standby. The Messages submenu is rather frugal. It contains SMS messages and a voice mailbox, but no patterns or, what is much worse, message delivery reports. Haier P5 has five quite traditional profiles: normal, noisy, car, conference, and personal. 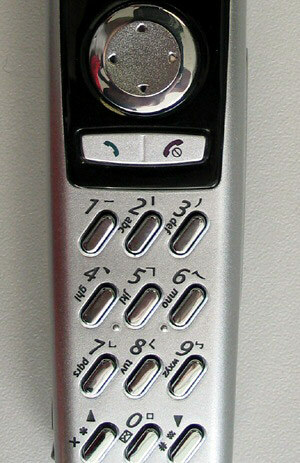 There are also various settings, such as call volume, signal type, or minute beep at the 50th or 55th second. Besides, you can select a type of connection report: vibration, signal, or backlight blink. A few words about the melodies preinstalled in P5. First of all, the tones are polyphonic, though not too quality due to the handset size. They are played through the speaker situated in the back side. All in all, it supports five signals and thirty melodies including the company's own Haier Song (as Nokia has its own melody, the Nokia Tune). Settings, among everything, enable to vary backlight brightness and display contrast, as well as to change the greeting and to activate an animated logo. Extras comprise calculator (rather incovenient but still manageable), alarm, three games (good old Tetris and two silly ones: Shoot Balloon, Push Ball), and laser pointer. I visited a lot of web-forums where people asked how to activate the latter function. Well, here's a brief instruction: select Laser in the main or fast-access menu and confirm it by pressing the call button. 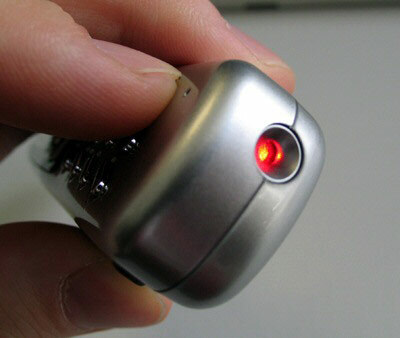 The phone switches to the appropriate mode where any key can turn on the laser pointer. To quit the mode press the off button. And take care not to direct the pointer to the eyes of people or animals, as it can have an irreversible effect on their sight. Each Haie P5 contains a sticker with a corresponding warning. Speaking about the connection quality, this handset that looks like a big thick antenna ensures good connection in any part of town. Strange as it may seem, but wherever we were the indicator never showed less than two points. Besides, due to the prolonged form of the body, the microphone will be right at your mouth, so your interlocutor will hear your voice perfectly. However, today's technologies have reached the level where it's very difficult to make a bad handset in terms of connection quality. To conclude, we'd like to add that Haier P5 could make a wonderful present. If you don't know what to present your friend or relative with, or if want to buy him a handset but haven't yet decided about the model, then P5 is just the best you can get. A phone with a unique unrivalled design, blue, red, or silvery, Haier will produce an indeliable impression on the presentee. Besides, the handset is supplied with a marvelous box which makes it look even more present-like. And if all of your friends and relatives already have cell phones, P5 can be a perfect present to yourself.